Kubernetes is an container-orchestration system which helps you to automate your deployment, scaling and management of containerized applications. Originally this platform was designed by Google and is today part of the Cloud Native Computing Foundation. Kubernetes is surely one of the major providers in the market of container operating systems. The WWW Inventor Tim Berners-Lee Launches a new open platform called “Solid”. With Solid, users can share their data with others without having to surrender their sovereignty to a group. Users should be able to decide for themselves who can access the data and which apps will be used. To solve the problem of how to control personal data, in Solid all data is stored in a so called Solid POD. This Solid POD can be in your house or workplace, or with an online Solid POD provider of your choice. Since you control your server you own your data. You’re free to move it at any time, without interruption of service. In my opinion, this is the only sensible solution to return data control back to the user. I hope this project gets enough attention. Your data is too serious to ignore. Today I found a very good article on DZone.com about how to manage persistence for statefull docker containers. The article is from StorageOS and gives a very good overview about the problems and requirements. The Way from JSF to MVC 1.0…. Traefik.io is a very cool open source project, providing a powerful reverse proxy. The project is focusing mainly on container based architectures like Docker Swarm. In such an environment Traefik.io is able to recognize new containers in a network and dynamically computes the route from the frontend to the corresponding backend service. I wrote about this functionality in combination with docker swarm already in my blog: Lightweight Docker Swarm Environment. This concept is also part of the Imixs-Workflow project. But what if you just want to add a kind of static route, which has nothing to do with container based services. I had this situation as I wanted to redirect incoming requests for a specific host name to an external server – outside of my docker swarm. This rule proxies requests for “www.myweb.com” to the host “some.host.de:12345”. See also the discussion here. If you play around with Apache Hadoop, you can hardly find examples build on Docker. This is because Hadoop is rarely operated via Docker but mostly installed directly on bare metal. Above all, if you want to test built-in tools such as HBase, Spark or Hive, there are only a few Docker images available. A project which fills this gap comes from the European Union and is named BIG DATA EUROPE. One of the project objectives it to design, realize and evaluate a Big Data Aggregator Platform infrastructure. The platform is based on Apache Hadoop and competently build on Docker. The project offers basic building blocks to get started with Hadoop and Docker and make integration with other technologies or applications much easier. 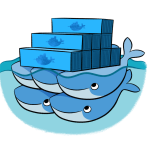 With the Docker images provided by this project, a Hadoop platform can be setup on a local development machine, or scale up to hundreds of nodes connected in a Docker Swarm. The project is well documented and all the results of this project are available on GitHub.